I have been battling a dragon. It breathed its fiery breath on me in 2006 for four months, disappeared as mysteriously as it came and then re-appeared in May of 2008 and has been my constant companion ever since. 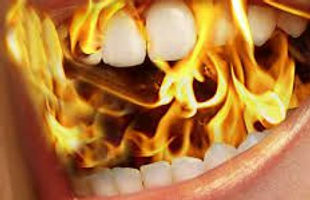 It is diffuse burning neuralgia that we finally are calling Burning Mouth Syndrome for lack of any closer diagnosis, since it began in the very back of my throat and palate (unusual for BMS) but has now spread to my tongue (typical in BMS). It may have been caused by dental procedures or a variety of things. We may never know. There is no official cause and there is no cure, only management of the symptoms. Through a plethora of specialists, medical tests (I won’t go into detail here because they were just too icky in many cases), vocal therapy, gastroenterology procedures, diagnostic nerve blocks, acupuncture, etc., I kept slogging along, hoping for a cure just around the next corner to no avail. Finally, after a year and half of constant pain that was only relieved by sleeping or drugs that made me very sleepy, I hit a wall and got very depressed and laid down my sword.